BEFORE improvements to the Hemlocks Pumping Station. 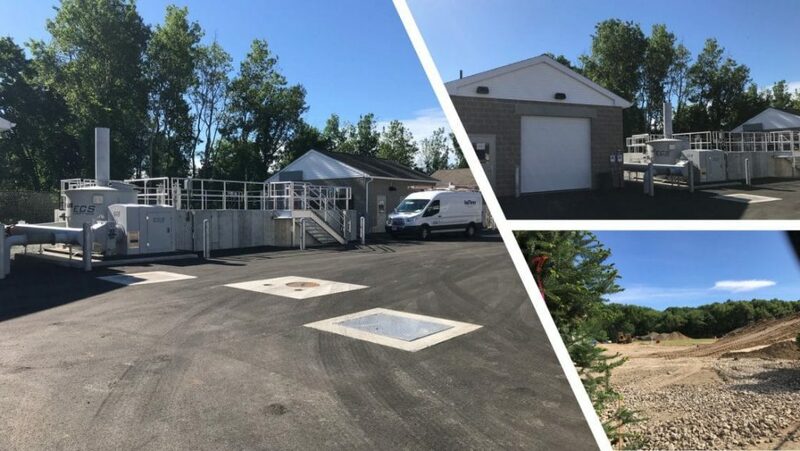 Tata & Howard provided engineering services for design, bidding, construction administration, and resident observation to Aquarion Water Company for improvements to their existing Hemlocks Raw Water Pumping Station in Fairfield, CT. 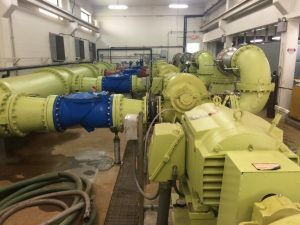 The project included refurbishing five 300 hp centrifugal pumps and motors, replacing the existing variable frequency drives (VFDs), installing new piping, check valves, and strainers for each pump. 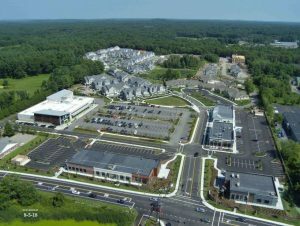 As this facility is a source of supply for Aquarion’s Main System, it needed to be kept operational throughout the construction. The sequence of work required a single pump to be taken off line; refurbished; reinstalled with new piping, VFD, and appurtenances; tested and placed back into service prior to the next pump being taken off line. AFTER improvements to the Hemlocks Pumping Station. Another important aspect of the project was to replace the existing strainers so that they were easier for the plant operators to clean as they get clogged with eels. To simplify maintenance, new stainless steel wye strainers with bottom access to the screens were installed on the suction side of each pump. 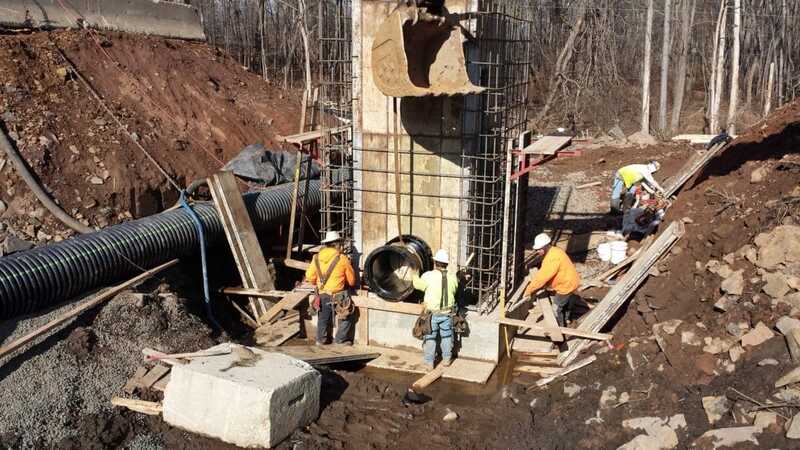 The Chamberlain Highway in Meridan, Connecticut has 536 linear feet of new 16-inch ductile iron main and two new fire hydrants. 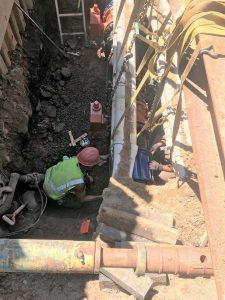 After Tata & Howard completed several test pits to verify connection locations at each end of the new main, construction work started on May 3, 2018 with the installation of a 16” x 16” tapping sleeve and valve at the north end of the project. This existing water main at the north end connection was originally installed in 1894. Work progressed south until the new main was approximately 50 feet away from the other connection point in West Main Street. Connections to the existing main in West Main Street was performed over a 36-hour period due to the complexity and amount of utilities around the service connection, including a live 24-inch water main five feet away and multiple telephone conduits located 6 inches above the replaced main. Tata & Howard personnel on site at all times to observe that work was in performed in accordance to the plans and specifications. Following the completion of the Chamberlain Highway water infrastructure improvement project, work to replace two water mains on the state-owned bridge crossing Sodom Brook in Meridan will begin. Flagstaff, AZ – Tata & Howard provided professional engineering design services to the City of Flagstaff, AZ for the replacement of three aeration units, as well as interior air piping improvements for the Rio De Flag Wastewater Reclamation Facility (WWRF). In addition, approximately 400 linear feet of existing air piping were replaced at the Rio De Flag WWRF. The exterior pipe was visibly leaking air. For technical and operational reasons, screw compressors were chosen over turbo blowers. Tata & Howard provided design services including preparation of plans, specifications, and bid documents for the installation of the new screw compressors. The existing air flow exterior pipe gaskets had deteriorated with the heat of the existing compressed air to where the piping was a safety problem and was also wasting energy. Tata & Howard worked with the City to provide shop approvals and assisted the City’s inspector to ensure the project met the plans and specifications. 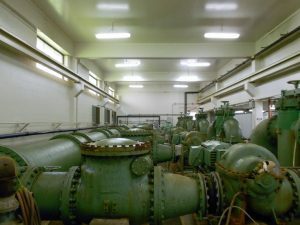 The existing blowers at the plant were 25 years old, had reached the end of their useful life, and did not ramp up and down with the wastewater flow. The new aeration units will flow pace with the changing incoming flow and saved the City enough electrical energy that it is projected to pay for the upgrade in eight years. The electrical power company (APS) offered a large rebate to reward Flagstaff for taking this energy and money saving opportunity. 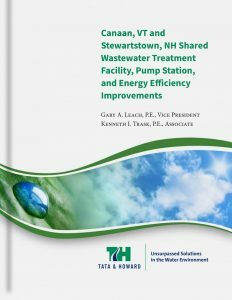 The Towns of Canaan, Vermont and Stewartstown, New Hampshire operate a shared wastewater treatment facility, which required significant upgrades. The existing facilities were 40 years old and although a few upgrades were performed in the 90s, the facilities were not performing well, did not meet Life Safety codes, and required significant maintenance. 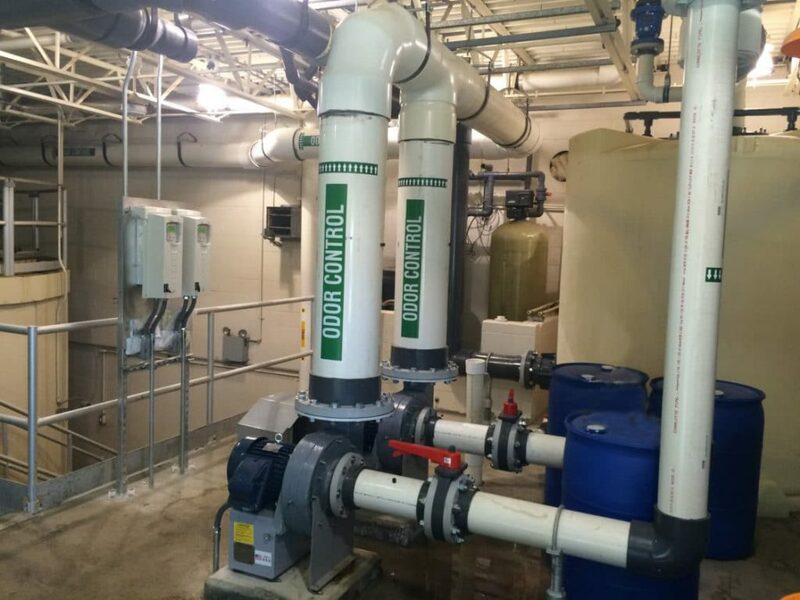 The upgrade met all of the goals of the Client by providing for simple operation and maintenance requirements, meeting the Life Safety codes, eliminating confined spaces, lowering of electrical power costs, and meeting discharge parameters through production of high quality effluent. The solutions developed for the upgrade to this facility were also economical. One of the primary elements of the design was the consideration of the economics of energy reduction. 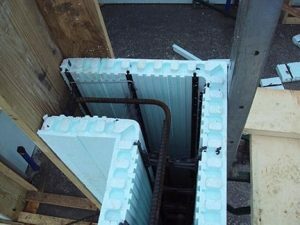 The design incorporated insulated concrete form construction for the building walls with R-49 insulation rating in the ceilings. The design also included a wood pellet boiler with a pellet silo and hot water heating system, which allowed for reduction of explosion proof heaters in the headworks building. All of the windows were low-E and highly insulated, and an outer glassed-in entry way increased the solar gain retention of the building and reduced heat loss. The process headworks and operations buildings were constructed as single story structures, increasing operator safety. The lagoon aeration system is now a fine bubble, highly efficient process with additional mixing provided by solar powered mixers that help reduce aeration requirements, improve treatment, and allows for the addition of septage, all at no cost due to solar power. The pump station upgrades were designed to eliminate daily confined space entry by the operator by the conversion to submersible pumps. For sludge removal, a unique and simple “Sludge Sled” system was incorporated, which allows the operators to easily remove the sludge at their convenience. Sludge treatment is accomplished with a geo-bag system that allows the sludge to be freeze dried, reducing the volume by almost 50% with no energy consumption. The influent pump station was designed with three pumps instead of the normal two-pump system in order to meet both present and future design flows, allow for lower horsepower pumps, improve flexibility, reduce replacement costs, and reduce energy costs. The other four deep dry pit pump stations were converted to wet wells and submersible pumps, eliminating confined spaces, and are equipped with emergency generators, eliminating the need for operator attention when power is lost. The incorporation of highly energy efficient building components resulted in reducing annual operation and maintenance costs, which resulted in lower user rates and a more sustainable facility. All building components are virtually maintenance free. All of the equipment and processes were selected to reduce both annual and future replacement costs. 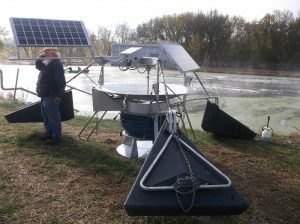 The treatment system is a 3-cell aerated lagoon system, and the solar powered mixers were installed to enable reduction of the aeration needs and horsepower during the summer months when septage is added. 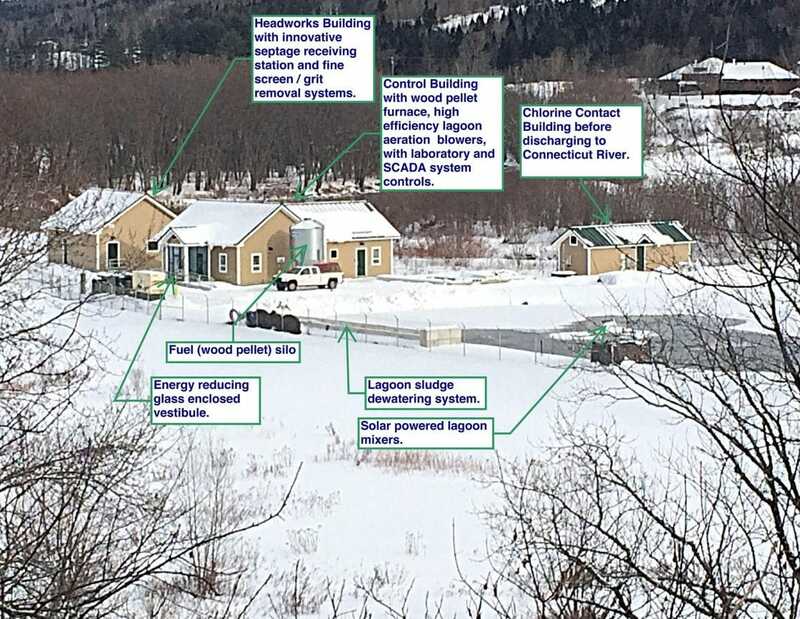 The aeration blowers, which are housed in insulated enclosures, reduce noise and were sized to allow for the addition of septage to the lagoons, which is not common in Vermont. The aeration blowers are controlled with Variable Frequency Drives (VFDs), which allow for greater operator control of aeration and provide energy cost savings. The operation is simple and safe for operators and others who need to maintain the facility and equipment. The design has provided flexibility to the operators and has resulted in an energy efficient, sustainable solution for this community. The wastewater treatment plant in Lyndon, Vermont was experiencing excessive odor issues. The existing odor control system relied primarily on chemical treatment, which was difficult for the operators to manage. 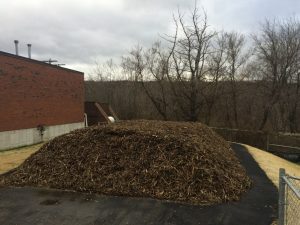 Tata & Howard’s project design consisted of a bio-filter with root mulch to remove the odors, which are primarily ammonia, that are generated from the Auto Thermophilic Aerobic Digestion (ATAD) sludge treatment vessels. The ATAD system is a system that results in class A sludge that can be spread anywhere as a fertilizer, and it reduced the annual volume of sludge produced at this facility by 65%. The new system includes fans that pull the air off the top of the ATAD unit vessels through a cool down water wash tank, which knocks down the ammonia, and then pushes the air through PVC piping up through the root bio-filter shown in the picture. The total cost was under $300,000, for which Tata & Howard procured the Town a 100% grant. The second part of the design project included a nitrogen reduction system for the secondary aeration process that may be necessary in the near future. The design includes a recirculation pump system from the Anoxic zone back to the Oxic zone. The Contractor was T. Buck Construction of Maine. 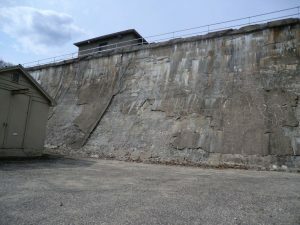 The Means Brook Reservoir Dam is a concrete gravity dam that was constructed on rock in 1916 in Shelton, Connecticut. The aging dam required repairs in to improve reliability and safety, modernization and rehabilitation of the gate chambers, and replacement of the deteriorated upstream and downstream faces of the dam and the crest, which were severely spalled and delaminated. Hydraulic, hydrologic, and structural studies had indicated that the dam would be overtopped by about 3.9 feet by the Probable Maximum Flood, and that the dam did not have sufficient stability factors of safety for this extreme loading condition. The dam reportedly overtopped by about four inches during the 1955 flood. In 1977, modifications were made to the dam including extension of the spillway to its current length of 100 feet, and construction of a 2.1-foot high concrete parapet wall along the upstream crest of the dam. New concrete surface designed with a nominal thickness of 12 inches on the downstream face and six inches on the upstream face. Installation of rock anchors post-tensioned in holes drilled through the dam into the rock foundation to improve stability and provide adequate factors of safety for overtopping by the Probable Maximum Flood. Removal and replacement of one section of the spillway training wall, and removal and resurfacing of concrete on remaining walls. Installation of galvanized steel pipe railings along the upstream and downstream crest of the dam for safety; steel pipe rails were chosen for the dam crest instead of chain link fence because the dam crest is subject to overtopping. The project received a 2017 Excellence in Engineering Merit Award from the American Council of Engineering Companies, Connecticut. Read more here. 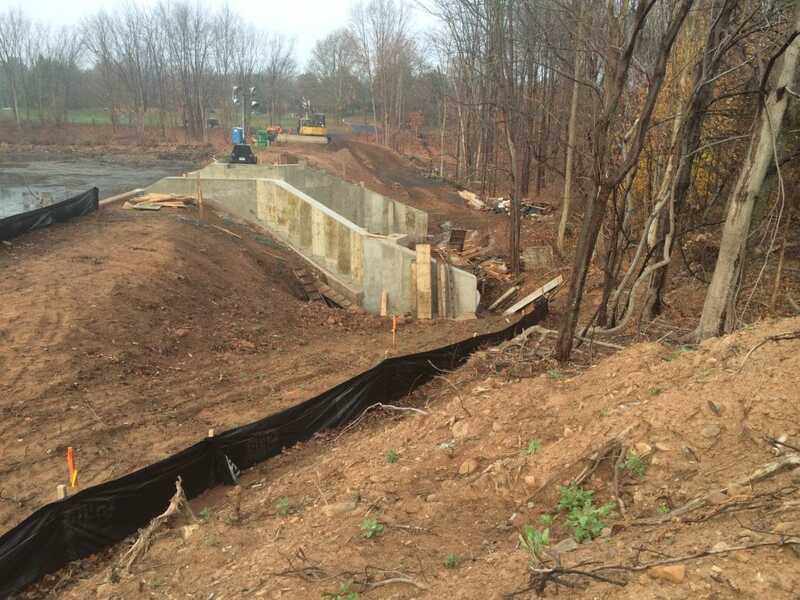 Baldwins Pond Dam is a stone masonry and earthen embankment dam located on Harbor Brook just upstream of Westfield Road. The dam has a length of about 200 feet and a maximum height of about 17 feet. A concrete gate chamber at the right (looking downstream) end of the spillway provides controls for the 30-inch low level outlet, which discharges through the right training wall. Access to the operator is provided through a hatch in the top of the chamber. The spillway has an overflow length of 85 feet and a stepped concrete apron at the downstream toe. The upstream embankment slope and the area downstream of the apron are protected with riprap. Baldwins Pond has a surface area of 6 acres and a tributary watershed of 8.34 square miles. 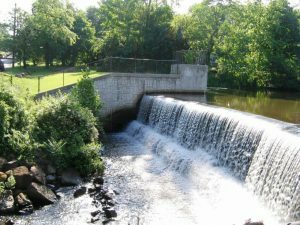 The dam was rehabilitated in 1998, designed by Tata & Howard’s Waterbury, CT office. The Fosters Pond Dam reconstruction project presented several challenges. The existing spillway was inadequate to discharge the 100-year spillway design flood, and the existing dam was in extremely poor condition. The embankments lacked erosion protection and were very steep, the crest was narrow, and the outlet had fallen into disrepair, rendering it inoperable. 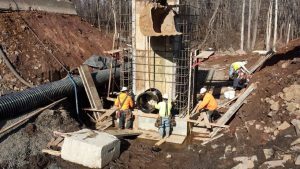 Therefore, it was imperative that the reconstruction design of Fosters Pond Dam be designed to improve both safety and reliability, provide a functional and operable outlet, and provide ease of maintenance. 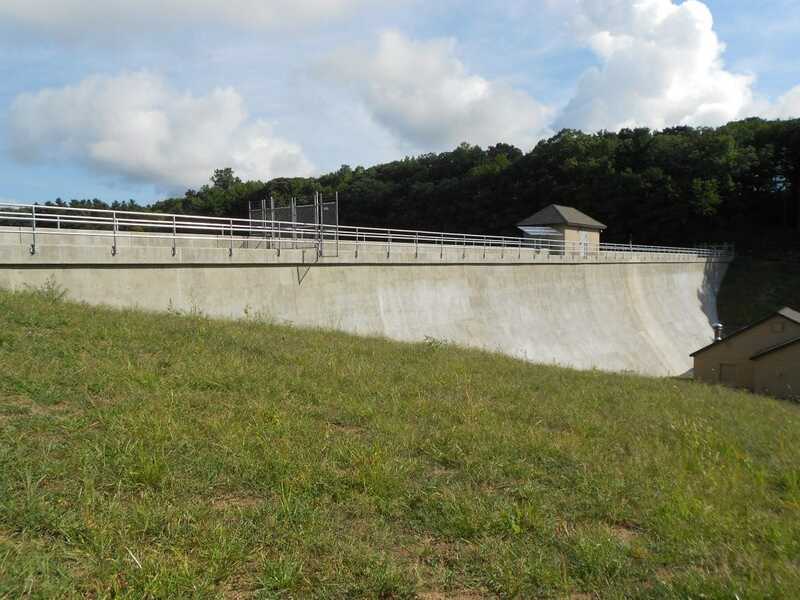 The reconstruction included the construction of new and higher reinforced concrete spillway training walls, upstream riprap erosion protection, a new reinforced concrete gate structure with 24″ inlet and outlet pipes and sluice gate, widened embankment crests to 12′, flattened slopes for ease of maintenance, and a gravel road to allow access to the embankment and gate structure. Riprap erosion protection is now provided on the upstream slopes as well as in the discharge channel. Because of these improvements, the dam can safely pass the 100-year spillway design flood with over a foot of freeboard. The length and level of the spillway weir remains unchanged.